A classified satellite code-named Zuma, , apparently suffered a mission-ending failure shortly after the boost to space, falling back to Earth over the Indian Ocean, a knowledgeable source said Tuesday. A senior SpaceX official, not addressing the fate of the satellite, said a data review showed the rocket itself worked normally. Because the payload was classified, SpaceX commentators revealed nothing about the satellite, which government agency owns it or when it was expected to be released from the Falcon 9's second stage. No details about its intended orbit -- or its purpose -- were revealed. SpaceX mission commentary covered the initial minutes of the launch, ignition of the rocket's second stage, jettison of a protective payload fairing and landing of the first stage back at the Air Force station. But in keeping with plans announced before launch, the company did not discuss any aspects of the payload or its intended orbit. That is standard procedure for classified missions. But in the wake of most such missions, the responsible agency -- usually the Air Force -- releases a post-launch statement several hours later to indicate the overall result. Reporters expected a statement of some sort from Zuma's builder, Northrop Grumman, but the company said nothing Sunday night. On Monday, rumors began swirling about a possible failure. When asked about an update, a Northrup Grumman spokesman said only that "this is a classified mission. We cannot comment on classified missions." Likewise, SpaceX initially had no comment. 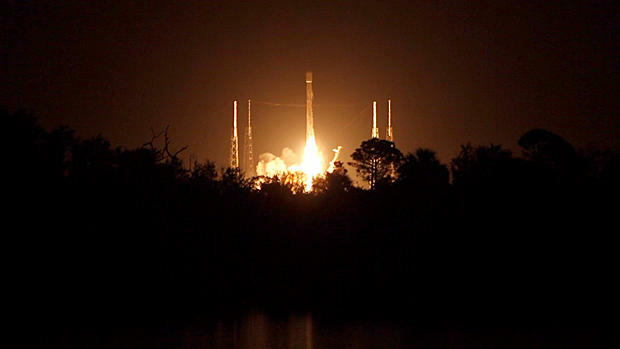 But early Tuesday, SpaceX President Gwynne Shotwell said in a statement that "after review of all data to date, Falcon 9 did everything correctly on Sunday night." "If we or others find otherwise based on further reviews, we will report it immediately," she said. "Information published that is contrary to this statement is categorically false. Due to the classified nature of the payload, no further comment is possible." As for upcoming SpaceX launchings, she said "the data reviewed so far indicates no design, operational or other changes are needed" and the company does not expect any impact on upcoming flights. That's a strong indication the presumed problem, whatever it might be, did not involve the rocket or any of its systems. The SpaceX Falcon Heavy rocket -- the most powerful ever -- is being prepped for its maiden flight later this month. The Wall Street Journal quoted unnamed sources Monday saying "the secret payload ... is believed to have plummeted back into the atmosphere ... because it didn't separate as planned from the upper stage of the rocket." Reuters also reported the satellite "failed to separate from the second stage of the Falcon 9 rocket and is assumed to have broken up or plunged into the sea." An informed source told CBS News Tuesday the satellite had, in fact, fallen back to Earth over the Indian Ocean. But the source did not indicate whether the satellite was still attached to the Falcon 9 second stage, which amateur satellite trackers said was expected to re-enter over the Indian Ocean at the end of its mission. Marco Langbroek, a veteran satellite tracker based in Leiden, posted an image in his blog that was taken by a Dutch 747 pilot over Khartoum, Sudan, a little more than two hours after the Falcon 9 took off. The photo "almost certainly" shows the rocket's second stage venting left-over propellant before re-entering the atmosphere, Langbroek wrote. "The sighting of the Falcon 9 Upper stage venting 2 hours 15 minutes (1.5 orbit) after launch, bear significantly on the discussion, as it seems to confirm the remarks by SpaceX that the mission was nominal," he wrote in his blog. "Of course, for SpaceX the mission ends at orbit insertion. "At any rate, it shows that at least the upper stage achieved orbit (so it was definitely not a launch failure where the rocket failed to achieve orbit), and it makes sense that the payload then did as well." He listed three possible scenarios if the satellite did, in fact, fail: Zuma could have been put into the wrong orbit; the satellite suffered some sort of internal failure after reaching orbit; or Zuma failed to detach from the second stage. The Space-Track catalog of tracked objects in orbit does not mention Zuma by name but lists a payload identified as USA 280, international designation 2018-001A, as launching from Cape Canaveral Sunday night. Jonathan McDowell, an astronomer who tracks rocket launchings, tweeted that the payload catalog number "conflicts with WSJ story that payload failed to separate from second stage (which is believed to have deorbited itself)," he wrote. "Consistent with SpaceX claim that rocket behaved correctly." He said it was "still possible that payload did not power up at separation, would account for at least part of today's rumors of a failure." But McDowell cautioned Space-Track "could be wrong in cataloging the object," which happened at least once before with a Landsat failure in the 1990s. "The lack of details about what occurred means that some possible alternate sequence of events other than a failed separation may have been the culprit," the Wall Street Journal said. Satellites can fall victim to any number of failures and malfunctions after separation from their boosters. Solar arrays must unfold as planned to re-charge batteries, for example, radios have to activate for commanding, flight computers must carry out stored programs as planned. And so it goes. In any case, the precise sequence of events with the Zuma mission may never be known.